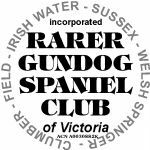 The Irish Water has achieved the ultimate in the show ring and obedience, in the field he is considered a retriever not a spaniel-making him truly the odd man out. It is the Irish whimsy that carries this dog through life with the name of Spaniel, the job of a retriever, and ability, but not necessarily the inclination, to achieve in all areas of competition. GENERAL APPEARANCE - Smart, upstanding, strongly built, compact. CHARACTERISTICS - Enduring, versatile gundog for all types of shooting particularly in wildfowling. TEMPERAMENT - Initially aloof, staunch and affectionate; with an endearing sense of humour and a stable disposition. HEAD AND SKULL - Head of good size. Skull high in dome; of good length and width allowing adequate brain capacity. Muzzle long, strong, somewhat square with gradual stop. Face smooth, nose large and well developed, dark liver colour, overall an impression of fineness. EYES - Comparatively small, almond shaped, medium to dark brown, intelligent and alert. EARS - Long oval-shaped; set low, hanging close to cheeks. NECK - Strongly set into shoulders, powerful, arching and long enough to carry the head well above level of back. FOREQUARTERS - Shoulders powerful and sloping; chest deep, reasonable width and curvature between forelegs. Forelegs well boned and straight. BODY - Ribs carried well back, so well sprung behind shoulder as to give a barrel-shape. Back short, broad, and level, strongly coupled to hindquarters. Loins deep and wide. HINDQUARTERS - Powerful; well angulated stifle and low set hock. FEET - Large round and spreading, well covered with hair over and between toes. TAIL - Short, not reaching to hock joint, straight, thick at root and tapering to a fine point. Low set, straight and below level of back. Three to four inches of tail root covered by close curls which stop abruptly. The remainder bare or covered by short straight, fine hairs. GAIT/MOVEMENT - Moves freely and soundly, with reach and drive; characteristic rolling motion accentuated by barrel-shaped rib cage. COAT - On body, dense, tight, crisp ringlets, free from woolliness. Hair having natural oiliness. Forelegs covered down to feet with curls or ringlets. Abundant all round, though shorter in front. Below hocks, hindlegs should be smooth in front and with curls or ringlets behind down to feet. On skull covering of long curls forming a pronounced top-knot, growing in a well defined peak to a point between the eyes. Ears covered with long twisted curls. Neck covered with curls similar to those on body. Throat smooth, the smooth hair forming a 'V' shaped patch from back of lower jaw to breast bone. COLOUR - Rich dark liver with purplish tint or bloom peculiar to the breed and sometimes referred to as puce-liver.